The season of Summerlicious is upon us so special posting schedule of two this week! 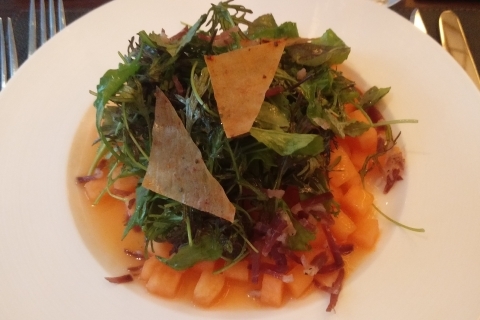 I went to Café Boulud for dinner with Laughliveat and checked out their Summerlicious menu. This is a restaurant that I’ve always wanted to try so I was really excited to check it out. The two of us met up at Bay station and noticed that our outfits matched. Clearly it was a good omen. We got a tad lost when we entered the restaurant, just because the entrance we used said D Bar, but a lovely hostess directed us upstairs to Café Boulud. 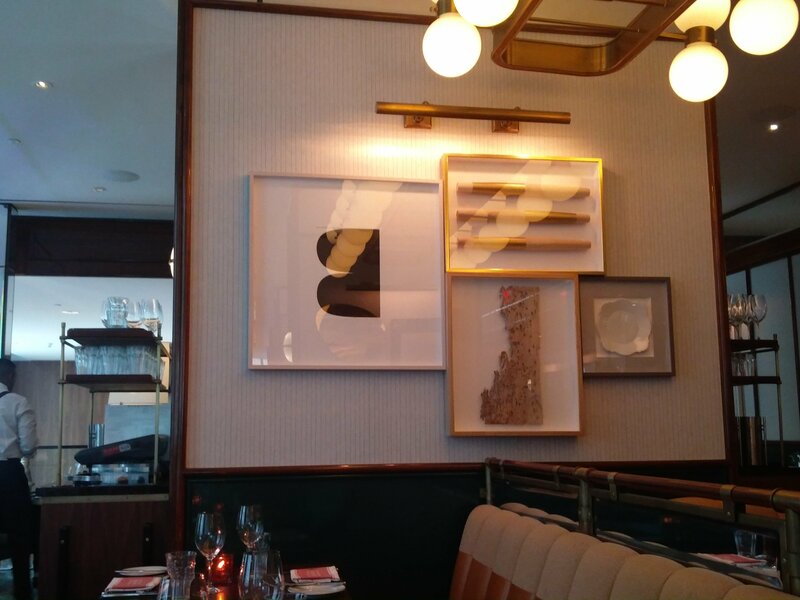 Café Boulud is, as I expected, French chic with a touch of art deco. 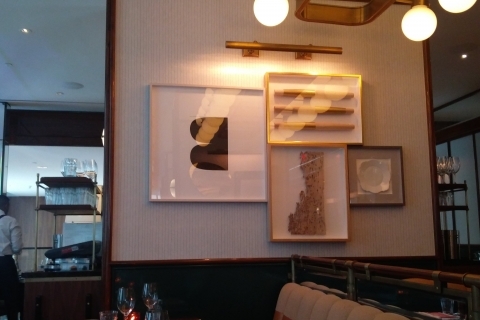 I loved all of the little details and couldn’t stop looking at the art and wondering where I could find something similar for my own dining room (which I now have on good authority is terribly hipster). Laughliveat and I amused ourselves by noticing the table we were sat at was the perfect interview set up according to our journalism prof.
For the appetizer, I got the Melon & Magret. 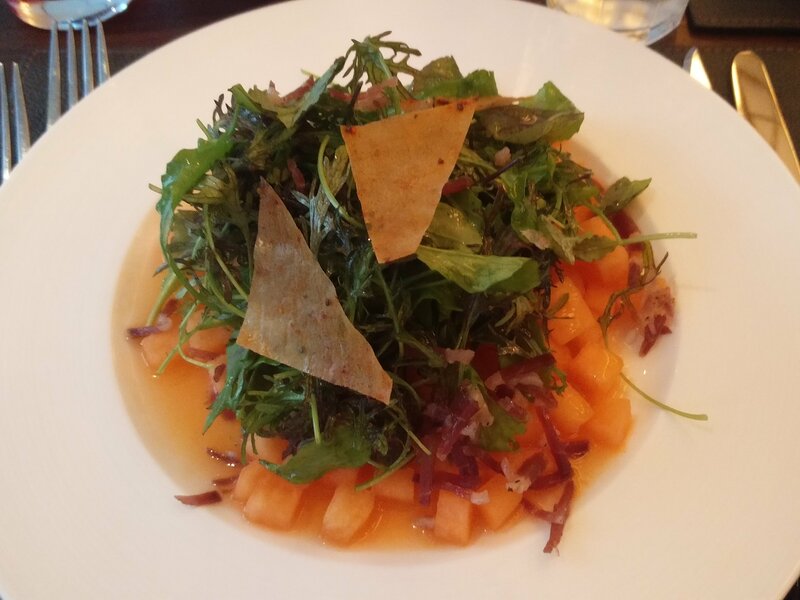 Essentially, it was an excellent salad made up of cantaloupe, duck breast and some spicy greens. The flavours were all very complimentary, which I actually worried about. The sweetness of fruit is always iffy at the end of the day. The saltiness of the duck worked wonderfully with the sweetness of the cantaloupe. The greens felt like they were there as a backdrop for the pairing of these flavours. I have to say, it’s been a while since I’ve had a salad quite so good and quite so satisfying. 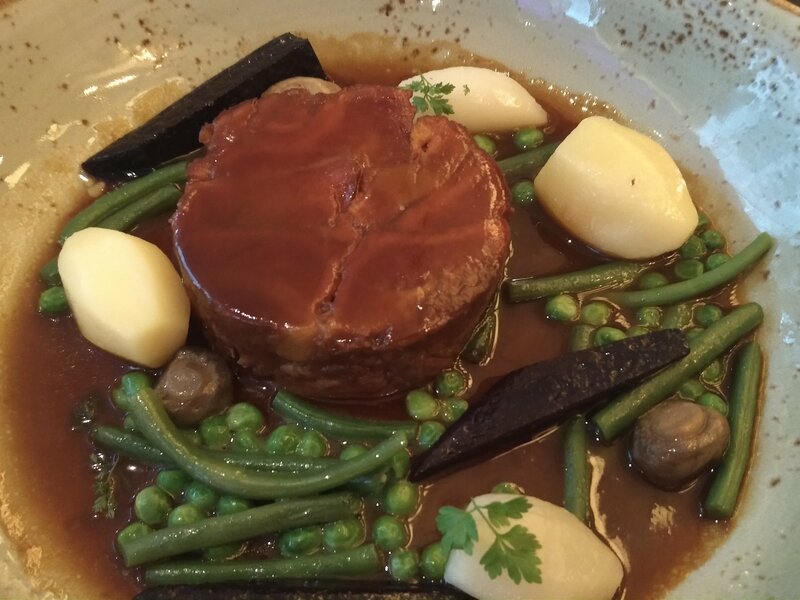 My entrée was the Navarin d’agneau, which is essentially lamb ragout. This one had carrots, turnips, mushrooms, and pomme tournee (which is essentially potatoes cut into a barrel shape, according to this thread). The first couple of bites were really good. The lamb was fantastically done, fell apart on my fork and wonderfully textured. I loved all the vegetables in the ragout and the sauce was really good. Around bite number seven, the dish started tasting too salty. It was like the sodium level decided to double itself randomly. I think around bite 12 I had to stop eating on a whole. 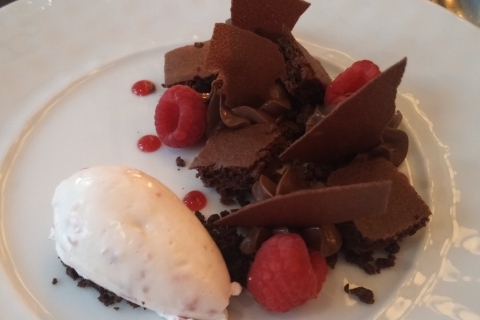 Saving the best for last, or traditionally known as dessert, was the Chocolat & Framboise. I definitely thought it was going to be something lava cakey and I was very wrong. 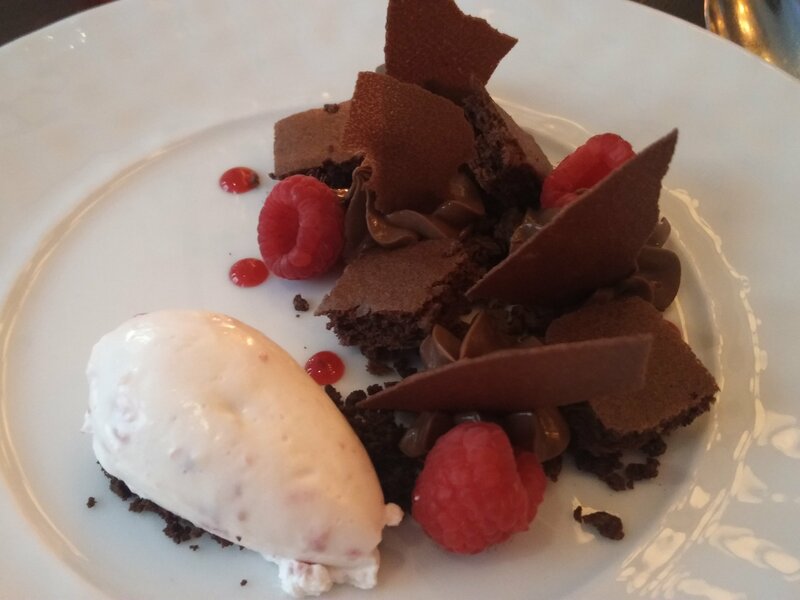 The best I can describe it is a deconstructed cake with a raspberry crème. The cake pieces were very fluffy and light, but not sweet and not as dark chocolatey as I expected. Which isn’t really a problem, it balanced out the crème and the chocolate sauce. Oh, and the artistically placed raspberries. As Summerlicious goes, this was as good as I expected. Lately, the event is starting to feel semi-not worth it and Café Boulud showed me that it was still a worth trying out. 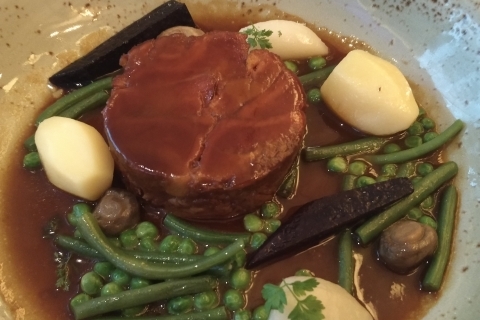 I’m going to less and less Summerlicious locations and I have to say that I would love to come to Café Boulud again, outside of Summerlicious/Winterlicious events. Someone call me and take me there again!